Septic tanks are an efficient method for treating wastewater and sewage produced by your property. You would be forgiven for assuming that all homes connect to a mains sewer line; however, for many rural properties, this just isn’t feasible or cost effective and so using a septic tank is a good solution. Let’s take a look at some of the advantages, as well as a few disadvantages, to using a septic tank. The biggest advantage of septic tanks for most people is that they offer you an independent water treatment solution. For homes and other properties which are in a rural location, the cost of laying a sewer line out to your building could be huge, making septic tank systems a much preferable option. Although installing a septic tank will come with its own costs, you can save on the fee that comes with connecting your home to the mains sewer line. Septic tanks lasting time can be very long. Depending on the materials used for your tank, a tank can last the entire time you live in a property. Typical lifespans are from 30 to 50 years, with longer operating times possible with good maintenance. 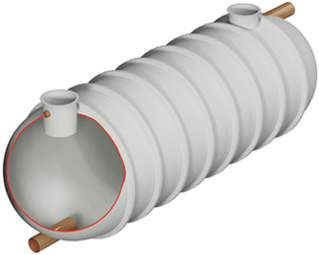 Septic tanks can be seen as an environmentally friendly wastewater treatment option. The treatment process relies heavily on natural processes, using bacteria and drain fields to break down and filter the sewage. Furthermore, the water being released into the soil will promote the growth of nearby plants and flora. Whilst you may have to be careful with what you put down your drains, the use of a septic tank can help you become aware of your water use and cultivate more water efficient habits. Not only will careful water usage be kind to your septic tank and the environment, it can save you money on bills. Unlike with mains sewer lines, the upkeep and repairs for septic tanks are your responsibility. This means you will have to be more involved in the running of your sewage treatment, organising periodic tank emptying and servicing yourself. If you don’t organise sufficient maintenance or are careless with what you send down your drains to your tank, you can run into a variety of issues. Problems range from bad odours to clogs and broken parts. If there is a sustained period of heavy rain, there is a risk that your septic system could overflow and sewage could end up at surface level. Wildon UK are experts in sewage treatment, operating from Stoke on Trent and covering locations throughout the UK. We are a well-established company with a skilled team and the expertise and training to tackle installations, maintenance and repairs on a wide variety of wastewater systems. Don’t hesitate to get in touch with our friendly and helpful team with any enquiries.